Joel wrote this bible book. He was a prophet to Judah (the southern kingdom) about the time of the reign of Joash, King of Judah, in 830 B.C., or Uzziah, King of Judah, in 750 B.C. <!-black-> What are some things that we know about Joel? If this prophecy was written about 830 B.C., then he probably knew the prophets Elijah and Elisha. A little later, the prophet Hosea preached in the north to the Kingdom of Israel. The prophecy of Joel was written from somewhere in Judah, possibly Jerusalem. At that time the nation of Israel was divided into two halves. The northern half was called the Kingdom of Israel while the southern kingdom was called the Kingdom of Judah. God had prophets preaching to each kingdom. Jesus Christ is portrayed as our Restorer. Why is Christ called our Restorer? Because Jesus can restore to us all that the devourer (Satan) has taken from us. <!-dark green-> "Vast clouds of locusts, darkening the sun, swarming upon the earth, devouring every green thing, brought the people of God to their knees. God heard their cry, removed the locusts, and promised an era of prosperity." <!-black-> The invasion of locusts was horrible but not as horrible as the invasion of an army coming against them in the Day of the Lord. This coming invasion is yet in their future. How they handle their national trial of a locust invasion will be how they are supposed to handle their national trial of an enemy army invasion. The Lord gives them their battle plan in this first chapter. And what is that plan? <!-black-> First, they are to fight as hard as they can. As they fought against invading locusts, they are to fight invading enemy soldiers. It is a matter of their national survival. But it is apparent to all that only a miracle from God will save them in spite of all their best efforts. Their best weapons are spiritual weapons and not physical weapons. What kind of spiritual weapons? Mourning over all of their sins, prayer to God for His help and deliverance, and personal and national repentance. <!-red-> "Turn to Me now, while there is time! Give Me your hearts. Come with fasting, weeping, and mourning. Don't tear your clothing in your grief; instead, tear your hearts." <!-purple-> Return to the Lord your God, for He is gracious and merciful. He is not easily angered. He is filled with kindness and is eager not to punish you. Who knows? Perhaps even yet He will give you a reprieve, sending you a blessing instead of this terrible curse. Perhaps He will give you so much that you will be able to offer grain and wine to the Lord your God as before! Blow the trumpet in Jerusalem! Announce a time of fasting; call the people together for a solemn meeting. Bring everyone- the elders, the children, and even the babies. Call the bridegroom from his quarters and the bride from her private room. The priests, who minister in the Lord's presence, will stand between the people and the altar, weeping. Let them pray, "Spare your people, Lord! They belong to You, so don't let them become an object of mockery. Don't let their name become a proverb of unbelieving foreigners who say, "Where is the God of Israel? He must be helpless!" (Revelation 16:13-16). This army comes from the north of Israel. This army could come from Russia or other nations that are north of Israel- or, there is another possibility. In the past many invading armies from the east would cross the desert regions north of Israel. The Assyrians and Babylonians did this. Those armies, after traveling westward, would then turn south and attack Israel so their attack would come from the north of Israel. <!-purple-> "Then the sixth angel poured out his bowl on the great Euphrates River, and it dried up so that the kings from the east could march their armies westward without hindrance"
(Hosea 8:1; Jeremiah 4:5; 6:1). <!-purple-> "And I saw three evil spirits that looked like frogs leap from the mouth of the dragon, the beast, and the false prophet. These miracle-working demons caused all the rulers of the world to gather for battle against the Lord on that great judgment day of God Almighty." <!-red-> "Take note: I will come as unexpectedly as a thief! Blessed are all who are watching for Me, who keep their robes ready so they will not need to walk naked and ashamed." <!-purple-> "And they gathered all the rulers and their armies to a place called Armageddon in Hebrew"
(Psalm 2:6). Then there will be a time of unparalled blessings. What kind of blessings? The nations who have treated the Israelites badly- their extreme brutality and willingness to hurt them rather than to show them love and kindness- will be judged and punished. <!-red-> "For that will be a time of greater horror than anything the world has ever seen or will ever see again. In fact, unless that time of calamity is shortened, the entire human race will be destroyed. But it will be shortened for the sake of God's chosen ones"
<!-purple-> "Now, brethren, concerning the coming of our Lord Jesus Christ and our gathering together to Him, we ask you, not to be soon shaken in mind or troubled, either by spirit or by word or by letter, as if from us, as though the Day of Christ had come. Let no one deceive you by any means; for "that Day" will not come unless the falling away comes first, and the man of sin is revealed, the son of perdition, who opposes and exalts himself above all that is called God or that is worshiped, so that he sits as God in the temple of God, showing himself that he is God"
<!-black-> At His second advent Christ introduces Himself as their Messiah and shows them His spear pierced side and nail pierced hands as proof of His identity. They instantly accept Him as their Messiah. They feel so ashamed for their unbelief and rejection of Him for so long a period of time. He volunteers to help them in answer to their prayers. He works a mighty miracle and subdues the enemy army and saves Israel. <!-red-> "It shall be in that day that I will seek to destroy all the nations that come against Jerusalem. And I will pour on the house of David and on the inhabitants of Jerusalem the Spirit of grace and supplication; then they will look on Me whom they pierced. Yes, they will mourn for Him as one mourns for his only son, and grieve for Him as one grieves for a firstborn. In that day there shall be a great mourning in Jerusalem, like the mourning at Hadad Rimmon in the plain of Megiddo. And the land shall mourn, every family by itself: the family of the house of David by itself, and their wives by themselves; the family of the house of Nathan by itself, and their wives by themselves..."
Revelation chapter 6-18; Revelation 19:11-21). <!-purple-> "In that day the Lord will punish the fallen angels in the heavens and the proud rulers of the nations on earth. They will be rounded up and put in prison until they are tried and condemned. Then the Lord Almighty will mount His throne on Mount Zion. He will rule gloriously in Jerusalem, in the sight of all the leaders of his people. There will be such glory that the brightness of the sun and moon will seem to fade away"
<!-black-> However, the Day of the Lord can also indicate a specific day when Christ destroys the armies of the antichrist at the Battle of Armageddon. In this battle blood will flow as deep as the horse's bridle. Some folks used to wonder how this could be possible, however, with the invention of the neutron bomb, many now realize this can take place. What is the neutron bomb? <!-blue-> "Neutron bombs are purposely designed with explosive yields lower than other nuclear weapons. This is because neutrons are absorbed by air, so a high-yield neutron bomb is not able to radiate neutrons beyond its blast range and so would have no destructive advantage over a normal hydrogen bomb. This intense pulse of high-energy neutrons is intended as the principal killing mechanism, not the fallout, heat or blast. Neutron bombs will "leave the infrastructure intact." <!-black-> Rumor has it, that when this bomb explodes, all of the blood of a person it hits will gush out of his body, leaving the rest of his body intact. Army tanks and rifles with wood stocks will be left intact but the soldiers who operate them will be dead. The Battle of Armageddon will be fought in a valley. What valley? It is the Valley of Jehoshaphat (the Kidron Valley on the east side of Jerusalem). There will be hundreds of millions of enemy soldiers concentrated there. If this weapon is used on them, it is possible that their accumulated blood flow will be that deep. Will our Lord allow the neutron bomb to be used on them? I think that it is a good possibility. <!-purple-> "Then I saw the beast gathering the kings of the earth and their armies in order to fight against the one sitting on the horse and his army. And the beast was captured, and with him the false prophet who did mighty miracles on behalf of the beast- miracles that deceived all who had accepted the mark of the beast and who worshiped his statue. Both the beast and his false prophet were thrown alive into the lake of fire that burns with sulfur. Their entire army was killed by the sharp sword that came out of the mouth of the one riding the white horse. And all the vultures of the sky gorged themselves on the dead bodies"
<!-black-> The valley of decision is a place of judgment. Sidonians, Philistines, Edomites, and Egyptians, (or their representative countries) may be there, among others, to help destroy Israel. No one should be in that valley fighting against God or Israel. That is the wrong decision. Pharoah of Egypt in the days of Moses declared war on God and he and his army were drowned in one day in the Red Sea. On a personal level, another wrong decision is NOT to repent and NOT accept Jesus Christ as your personal savior. The right decision is to invite Him into your heart by faith through prayer and place Him on the throne of your life. <!-black-> Satan will suffer a great defeat. 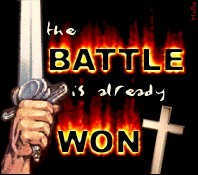 The armies of the earth that he is using at the time against Israel will be defeated. The spiritual armies of fallen angels he is using at the time will be defeated. Satan will be thrown into prison (the bottomless pit) for one thousand years. Satan will know that he is running out of time in those days but he will be absolutely powerless in the bottomless pit. Satan is not God and he has never been more powerful than God. <!-purple-> "Then I saw an angel coming down from heaven, having the key to the bottomless pit and a great chain in his hand. He laid hold of the dragon, that serpent of old, who is the Devil and Satan, and bound him for a thousand years; and he cast him into the bottomless pit, and shut him up, and set a seal on him, so that he should deceive the nations no more till the thousand years were finished. But after these things he must be released for a little while"
<!-purple-> "Beat your plowshares into swords And your pruning hooks into spears; Let the weak say, "I am strong." Assemble and come, all you nations, and gather together all around. Cause Your mighty ones to go down there, O Lord. <!-red-> "Let the nations be wakened, and come up to the Valley of Jehoshaphat; For there I will sit to judge all the surrounding nations. Put in the sickle, for the harvest is ripe. Come, go down; For the winepress is full, the vats overflow- for their wickedness is great." <!-purple-> "Multitudes, multitudes in the valley of decision! For the day of the Lord is near in the valley of decision"
(Joel 2:28). This prophecy found it's initial fulfillment on the Day of Pentecost. The outpoured Spirit of God on the Day of Pentecost is a foretaste of what folks can expect when Christ's Kingdom is established on this earth. (Acts 2:4). This is a wonderful blessing of "fire and power" available to each believer in Jesus Christ. I recommend that you seek the Baptizer (Jesus Christ) so that you can receive this wonderful spiritual experience as millions of others have. God is such a wonderful blessing. <!-red-> "In the last days, God says, I will pour out my Spirit on all people. Your sons and daughters will prophesy, your young men will see visions, your old men will dream dreams. Even on My servants, both men and women, I will pour out My Spirit in those days, and they will prophesy. I will show wonders in the heaven above and signs on the earth below, blood and fire and billows of smoke. The sun will be turned to darkness and the moon to blood before the coming of the great and glorious day of the Lord. And everyone who calls on the name of the Lord will be saved"
<!-black-> This is the beginning of God the Holy Spirit being poured out upon all humanity. This wonderful experience of the Baptism in the Holy Spirit is now starting for the church age at the Day of Pentecost. That is why this experience is called the Pentecostal experience and that is why many church folks who have had this experience call themselves pentecostal believers. And just like with Peter, the reason God gives us more of His power (baptizes us with fire and power) is for evangelism purposes. We are to live a life of holiness and then win others to Christ. We are not saved to sit but are saved to serve. <!-black-> What does the outpouring of God the Holy Spirit on all of humanity have to do with the Day of the Lord (His time of judgment)? God is at work in this world influencing folks not to do evil. God often uses you or I to help in this work. Let's do our part to help hold back the spread of evil across our world. But there will come a time when our efforts will not avail. When that time comes, God will judge this world. The Day of the Lord does not end until after the last battle is fought. When will that be? The last battle will be fought after the Millennial Reign of Christ- after Satan is loosed from prison (the bottomless pit). That earthly army is defeated and Satan and his imps are literally thrown into hell. Then the Day of the Lord will end. The earth will be renovated with fire and recreated. At that time God will lavishly bless those on the earth with Himself. This is Wonderful (Wonderful is one of the names of Christ) since God is the greatest treasure in the universe. <!-red-> "Look, I am making all things new! And then He said to me, "Write this down, for what I tell you is trustworthy and true." And He also said, "It is finished! I am the Alpha and the Omega- the Beginning and the End. To all who are thirsty I will give the springs of the water of life without charge! All who are victorious will inherit all these blessings, and I will be their God, and they will be my children"
<!-red-> "I will give you back what you lost to the stripping locusts, the cutting locusts, the swarming locusts, and the hopping locusts (Satan's servants). It was I who sent this great destroying army against you. Once again you will have all the food you want, and you will praise the Lord your God, Who does these miracles for you"
1) Mankind's depraved nature is bent towards committing evil. 2) Satan tempts, lies, falsely accuses, and persecutes us. We should not follow him. The first couple (Adam and Eve) gave our authority to Satan. Mankind fell into sin. Depravity, death, and broken fellowship entered our human condition. Mankind botched things up. Christ had to come and be our Second Adam and be our restorer. Why? So that those who believe in Him will have salvation, healing, peace and fellowship with God. They jumped ahead of God's timing in failing to wait for the fulfillment of God's promise. They botched things up. God allowed Hagar and Ishmael to be sent away from them. Then God restored the marriage of Abraham and Sarah and He gave them Isaac in their old age. Job did not botch things up but Satan botched things up for him. Job lost his health, children, reputation, and fortune. He had nothing left but his integrity. In the end God restored his health, children, reputation, and fortune. David had her husband murdered. Their first son died. They really botched things up. But after their repentance, God restored to them another son, Solomon.